The meeting in January was held away from our usual base at Brindle Community Hall. Sixteen members attended an evening at Clayton Green Library when the Secretary gave a presentation on ‘Using The Internet For Research’. The talk covered using various free and commercial websites for family research, military research and other history topics – these ranged from Census returns from 1841 to 1901 on www.ancestry.co.uk to the recently released 1911 Census on www.findmypast.com. 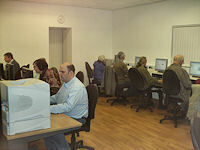 Afterwards, everyone had the opportunity for some ‘hands-on’ experience using the Internet facilities at the Library. Thanks go to Steve Bailey, the Librarian, for hosting the evening.